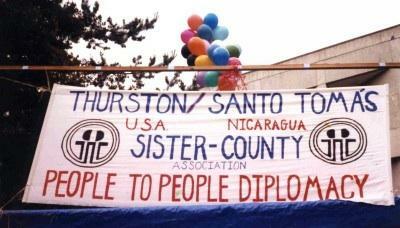 Thurston-Santo Tomás Sister County Association is pleased to announce that we will be hosting another Community Delegation to Nicaragua in the summer of 2015. Delegates will spend up to 3 weeks in Nicaragua, the majority of which will be spent in Santo Tomás. We will visit and volunteer in projects such as the children’s free lunch program, the library, several preschools, the health clinic, the model farm, youth programs and Lincoln Elementary’s sister school Rúben Darío. Some interpretation support and Spanish language classes will be available as well. Homestays provide the visitors opportunities to share in the daily lives of Nicaraguan families; many previous delegates have maintained lifelong relationships with their hosts. Delegations from Santo Tomás to Olympia have provided Olympians the opportunity to reciprocate hospitality. Got kids? Children who’ve traveled with us to Santo Tomás have had particularly wonderful experiences, with many of them returning as young adults to rekindle the friendships they formed years earlier. You’ll see photos and hear stories from previous delegations, as well as dates and costs of the trip. No RSVP is needed, but if you have questions in the meantime you can e-mail us at tstsca[at]gmail.com.